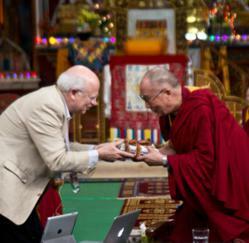 Presented through The Dalai Lama Trust in New York, this million-dollar gift will support dialogues between scientists and contemplatives, development of a science-based program in secular ethics and more. The Board and staff of the Mind & Life Institute were excited to learn this week of a pending gift of $1,000,000 to Mind and Life from Tenzin Gyatso, His Holiness the 14th Dalai Lama. The gift, presented through The Dalai Lama Trust in New York, will provide crucial support for Mind and Life’s central activities. “This commitment to support Mind & Life’s core expenses took my breath away. It is both an expression of gratitude from His Holiness for what Mind and Life has achieved, but even more an encouragement and strong affirmation of the future work to which we are committed,” said Arthur Zajonc, President of Mind and Life. Mind and Life programs to be supported by the gift include public dialogue events between scientists and contemplatives, Mapping the Mind, an interdisciplinary research initiative to explore the contours of human consciousness, as well as research to alleviate suffering associated with craving and addiction. Of particular interest to His Holiness is a new global research and development initiative, Educating our Humanity, that is inspired by His Holiness’ book Beyond Religion. This program recognizes that a modern ethics must reach beyond any particular religion for its foundation, and seeks to design a science-based curriculum to foster the ethical dimensions of human character such as compassion, altruism and kindness from early childhood through adulthood. “This is a fantastic development and powerfully represents His Holiness’ most active support and encouragement of Mind and Life and its mission,” stated Thupten Jinpa, Chair of the Board at Mind and Life. Mind and Life is a global non-governmental organization which seeks to alleviate suffering and promote human flourishing by using an ever-increasing understanding of the human mind, consciousness and the nature of reality, arrived at through the joint investigation of both rigorous science and the practice of contemplative inquiry.